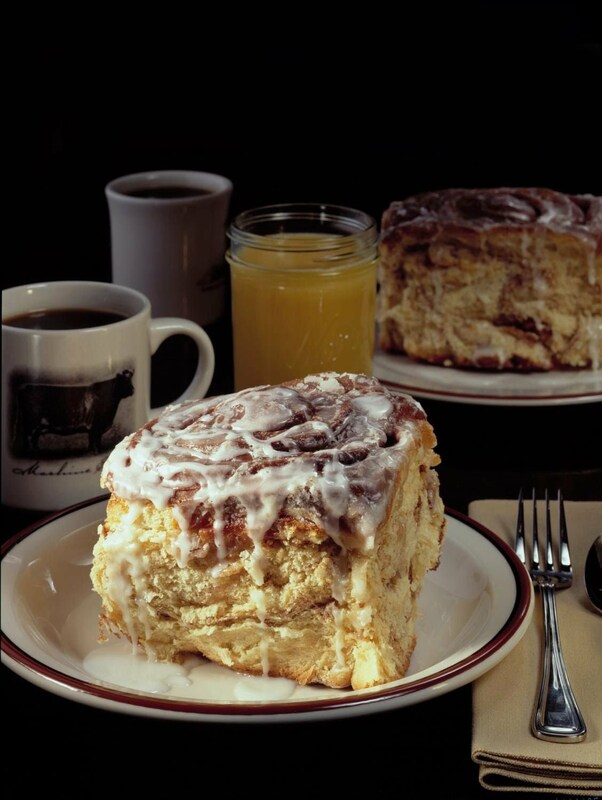 Huge, one-pound cinnamon rolls topped with buttercream frosting are a signature dish at the Machine Shed located on Northwest Boulevard at I-80. Forget the calories. These have to be tasted to believe. And the experience is one of culinary delight. 1. In very large mixing bowl combine 3 1/2 cups of the flour and yeast. 2. In medium pan, heat milk, butter, sugar and salt just till warm (120-130 degrees) and butter is almost melted, stirring constantly. Add to flour mixture. 3. Add eggs and vanilla, beating with a mixer on low for 30 seconds, scraping sides of bowl constantly. Beat on high for 3 minutes. Using a wooden spoon, stir in as much of the remaining flour as you can. 4. Turn dough out onto a lightly floured surface. Knead in enough of the remaining flour to make a moderatly soft dough that is smooth and elastic (3-5 mins total). 5. Shape into a ball. Place in greased bowl, turning once. Cover; let rise an a warm place until double. approximately 1 hour. 6. For filling, combine brown sugar and cinnamon. Grease two 13x9x2" baking pans; set aside. 7. Punch dough down and turn onto a lightly floured surface. Divide dough in 1/2. Cover and let rest 10 minutes. Roll 1/2 the dough to a 16x12" rectangle. 8. Spread dough with half of the softened butter. Sprinkle with half the brown sugar and 1 T cinnamon. Roll up jelly roll style starting with one of the short sides; pinch edges to seal. Slice roll into 6 pieces. 9. Arrange dough pieces cut side up, in one of the prepared baking pans. Repeat with remaining dough, butter and filling. 10. Cover and let dough rise in a warm place until nearly double (about 45 mins.). 11. Preheat oven to 350. Bake for 35-40 minutes or until browned and rolls sound hollow when lightly tapped. 12. Remove from oven, cool for 1 minute then invert onto wire rack. Invert again onto serving platter and spread with butter cream icing. 1. In large bowl, beat together softened butter, 3 cups powdered sugar, vanilla and salt. Gradually beat in evaporated milk. 2. Beat in enough additional powdered sugar (about 1 1/2 cups) to make a soft spreading consistency.